The next several days around the Upper Midwest will be quite an anomaly. It's won't be just one day with significantly above average temperatures, it'll be several days in a row... Enjoy if you like this early spring weather! 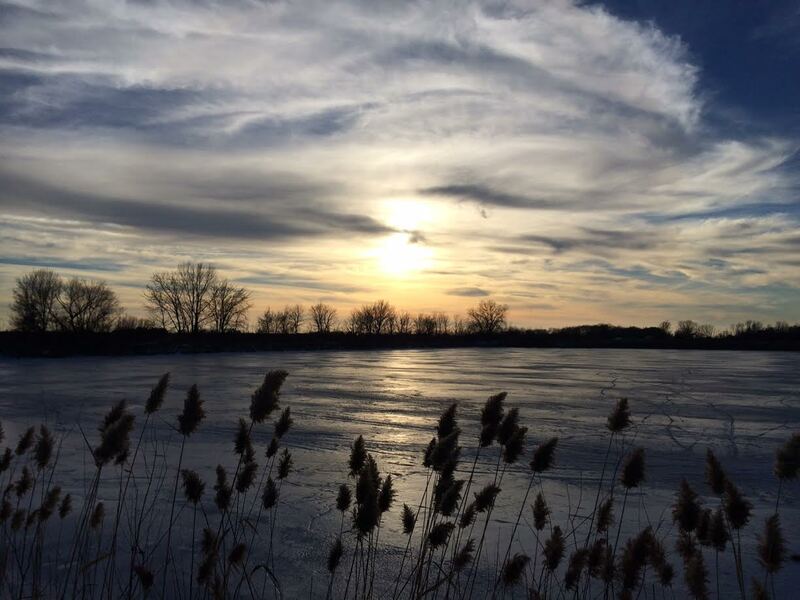 Because of that, official are warning of thin ice on area lakes. There have been several cars that have already gone through lakes, so angler should stay aware of their situation before heading out. 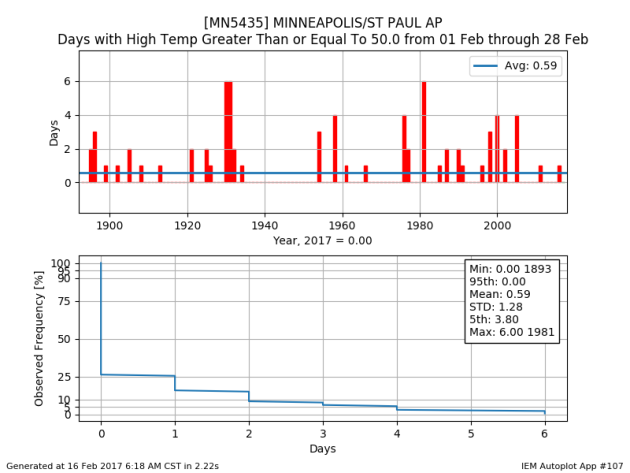 How Rare are 50F+ in February in the Twin Cities? Take a look at the red lines below, this tells us how many times the Twin Cities has seen 50F or warmer since the late 1800s. Note that we've only had a maximum of 6 days and has happened only 3 times, in the 1930s and again in 1981. Note that the next 6 days are forecast to be at or greater than 50F! Here's the temperature outlook through February 25th, which shows well above average temperatures continuing through the weekend and into early next week. 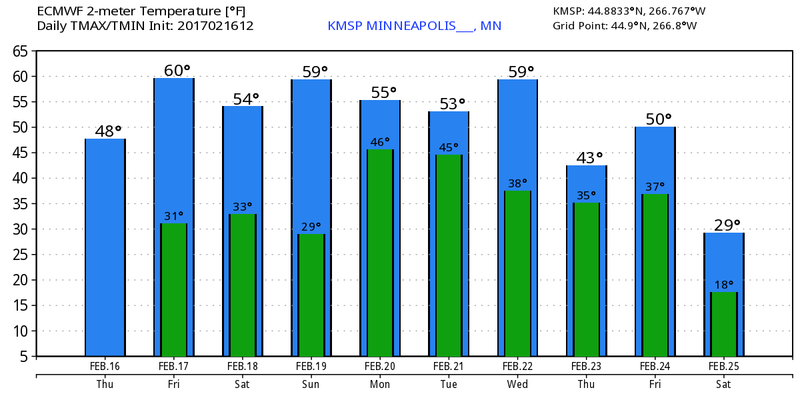 Note that we could see our first 50F in the Twin Cities since November 28th (55F) and we may even see our first 60F in the Twin Cities since November 16th (61F). This weekend is going to feel very much like April with highs in the 50s to near 60 degrees! Unreal! Thanks to the National Weather Service for the numbers below, which tell us how high the record highs are from 2/16 to 2/22 in Minneapolis, St. Cloud and in Eau Claire. Note that several of these records have a chance at being beaten in the days to come. If you're a fan of this warmer weather during meteorological winter, enjoy! What is the record for consecutive days with highs of 50 degrees or higher in February? How often does the temperature reach 60 degrees or higher in February? 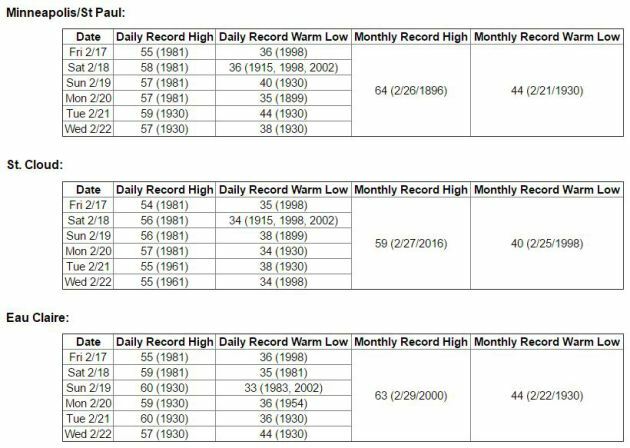 There have only been 4 days on record (back to 1873) when the temperature has reached 60 degrees or warmer in February (1896, 1921, 1981, 2000). There have been no days on record with a temperature of 60 degrees or warmer in February since temperature records began in St. Cloud in 1894. As temperatures warm later this week, record warmth could follow. 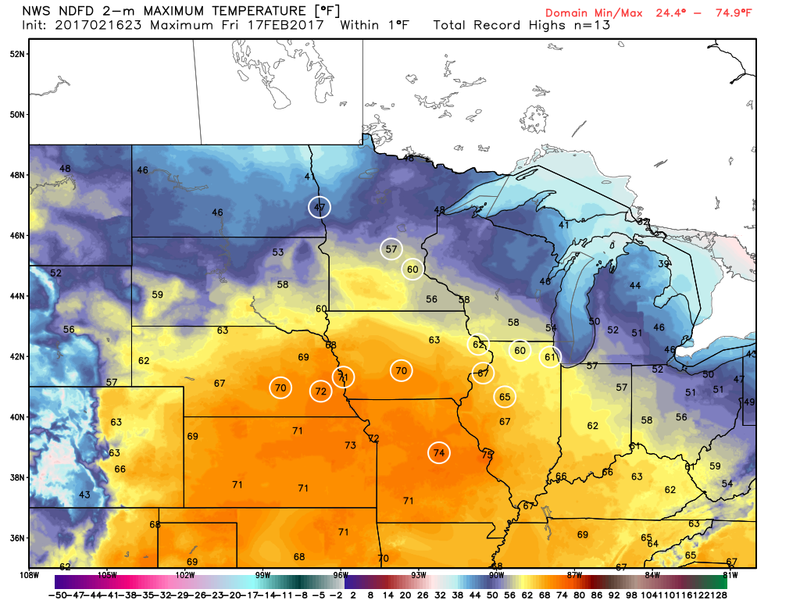 The images below show where record warmth is forecast (circles) for Friday, Saturday, Sunday and Monday. 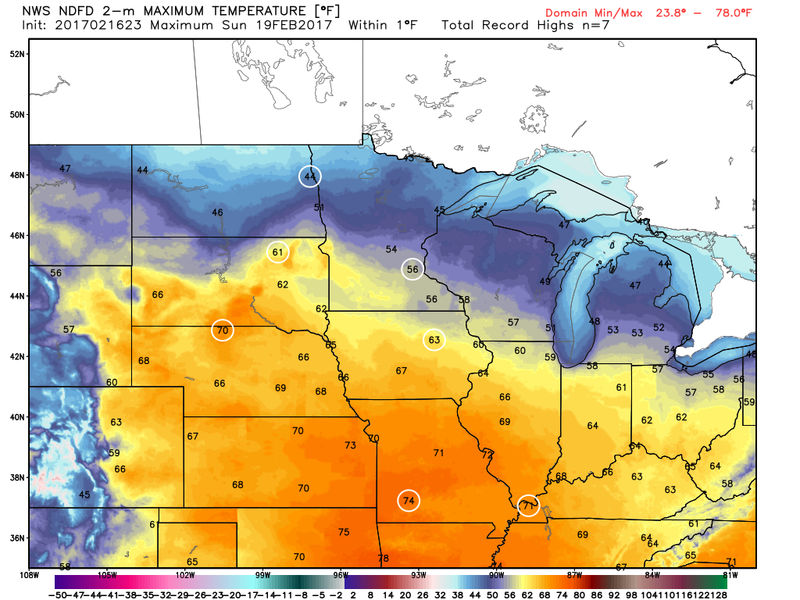 Note that by Friday, record warmth could stretch as far north as Minneapolis, MN, St. Cloud, MN, and Fargo, ND! I hope you don't mind if I get a little nerdy on you, but here it goes. Something stood out to me while looking at weather maps yesterday. The 850 millibar temperature (temperature a few thousand feet off the ground) is forecast to be in the mid 50s today. According to NOAA's Storm Prediction Center, this 850mb temp is more typical in June. Good grief! 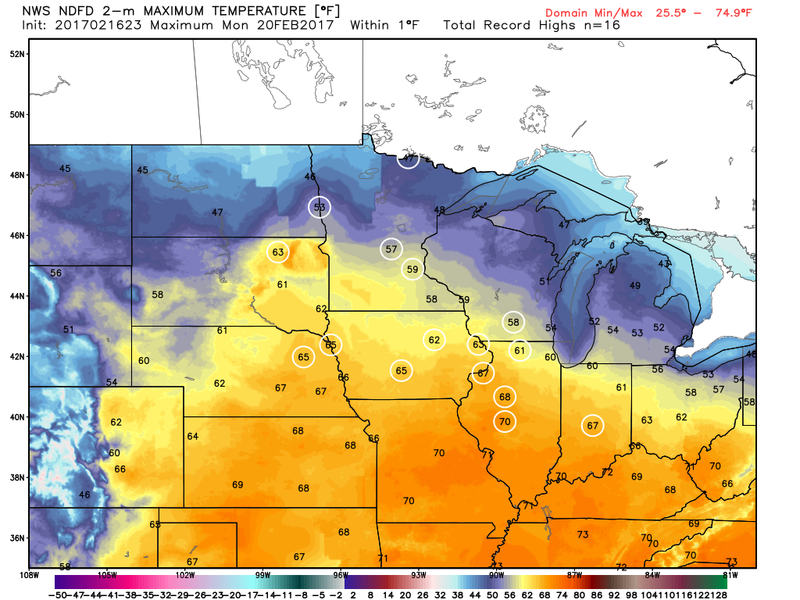 With that said, we should be able to mix some of that abnormally warm air down to the surface today and with a lack of snow on the ground, we have a good shot at hitting 60 degrees across much of southern Minnesota! If we hit 60 degrees in the Twin Cities on Friday, it'll be the first 60 since last fall; November 16. Note that it will only be the 5th time the cities has hit 60 in February! While we bask in the spring-like weather here, parts of California will get soaked. Locations near Los Angeles, CA will be flooded by nearly 3 to 6 inches of rain through Saturday. 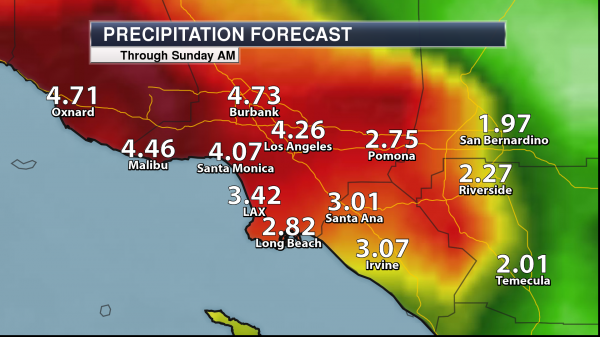 The foothills north of L.A. could see 5 to 10 inches of rain, while 1 to 2 feet of snow falls in the L.A. mountains! FRIDAY: Sunny. Record warmth. Winds: SSW 5. High: 60. SATURDAY: Hazy sun. Hints of April. Winds: W 5. High: 54. 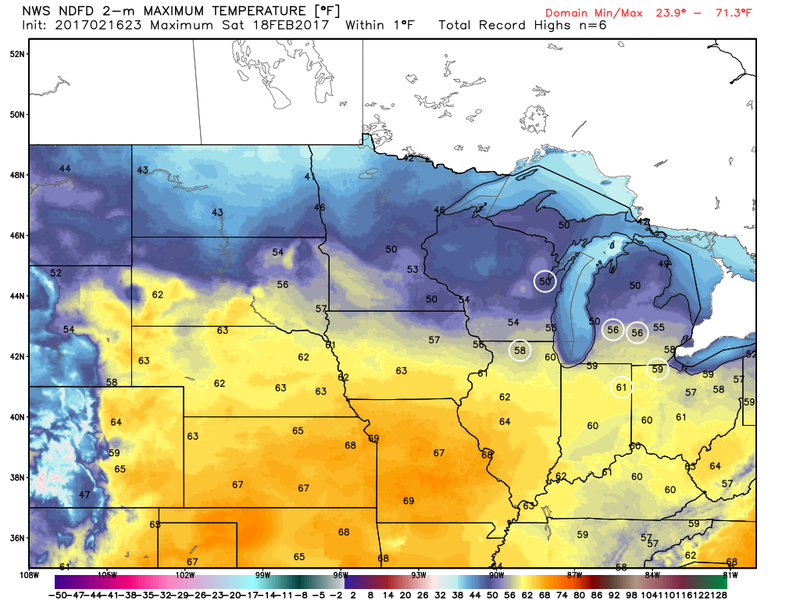 SUNDAY: Another record high? More PM clouds. Winds: SSE 5-10. Wake-up: 35. High: 57. MONDAY: February rain. Faint rumble of thunder? Winds: S 10-15. Wake-up: 46. High: 59. TUESDAY: Sun pops back out. Still very warm. Winds: SSW 5-15. Wake-up: 43. High: 55. WEDNESDAY: More like March. Increasing clouds Winds: NW 10-15. Wake-up: 40. High: 47. THURSDAY: Breezy. Getting cooler. 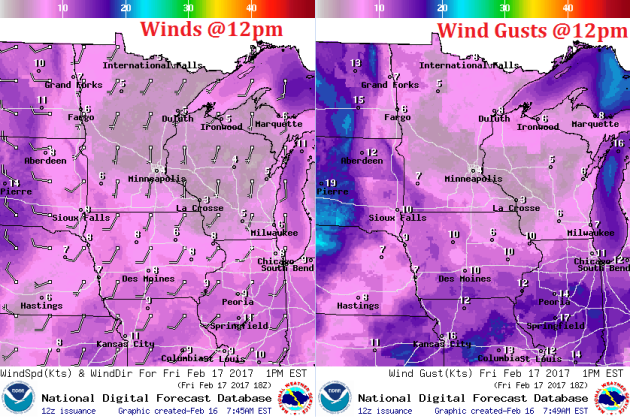 Winds: NE 10-20. Wake-up: 37. High: 45. 1981: Warm weather continues across Minnesota with a record high of 55 in the Twin Cities. Crocuses were blooming. 1894: The Minneapolis Weather Bureau journal notes: 'Sleighing is very poor, about half of the vehicles are on wheels'. 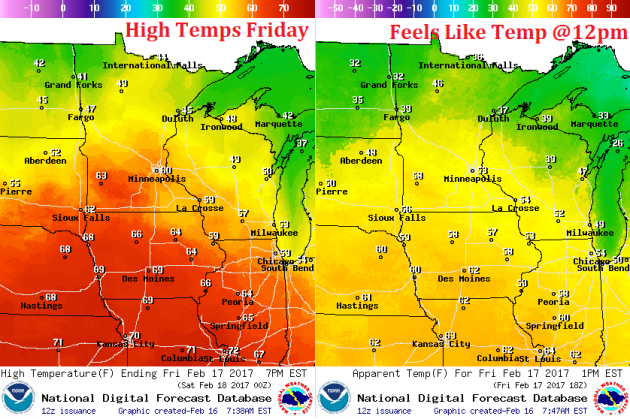 High temperatures on Friday will be EXTREMELY warm for Friday with highs running nearly 20 to 30 degrees above average. In fact, it'll be so warm on Friday that some may reach record levels! Winds will remain light on Friday and out a southerly direction, which will help to keep the much warmer than average temperatures streaming into the region through the day. Another nicety for Friday's very spring-like weather will be plentiful sunshine! 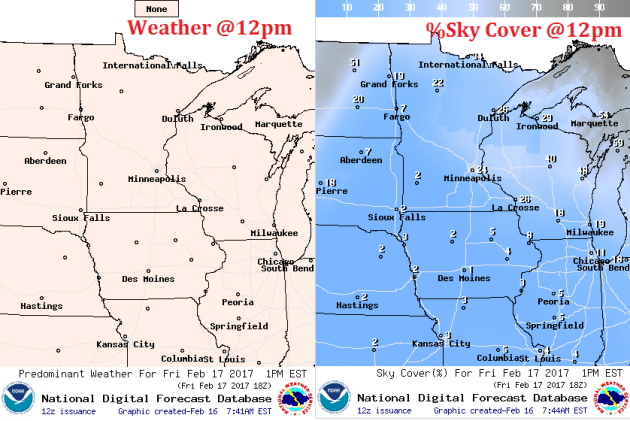 Take a look at the percentage sky cover map below around midday Friday. Other than a few scattered clouds, mostly sunny skies look to persist on Friday! Here's the weather outlook from Friday to Monday. Note that we stay mostly dry all the way through the weekend. Our next best chance of precipitation doesn't arrive until Monday and at that point, temperatures look to be warm enough for February rain showers. Interestingly, weather models are hinting at a little instability, which would indicate the possibility of a few rumbles of thunder across parts of the Upper Midwest if this system stays together. Interestingly, the 30 year average for the Twin Cities suggests that February averages less than 1 day of thunderstorms (0.1 days) during the month. Our next storm system moving through the Upper Midwest early next week have the potential of dropping 0.25" to 0.50" liquid across the region, some of this could be aided by thunderstorm activity on Monday. 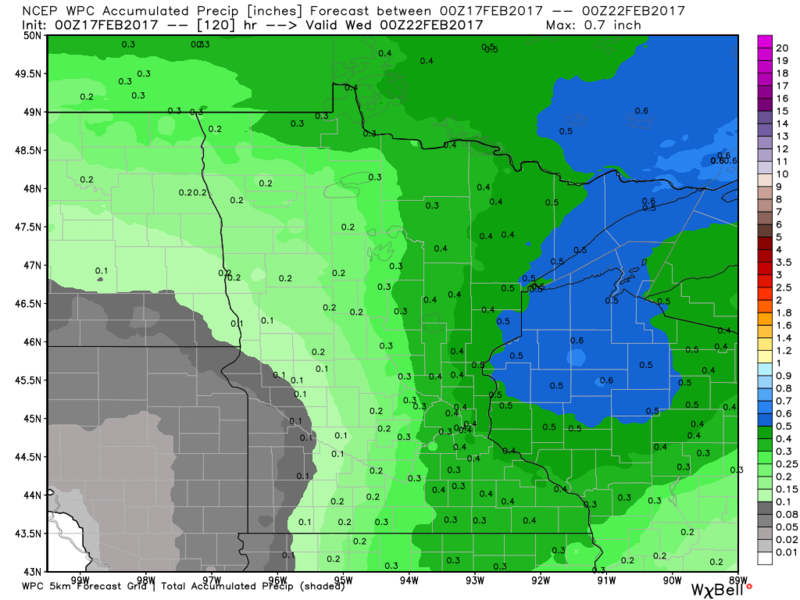 Note that the heaviest precipitation looks to fall over parts of northwestern Wisconsin and across the Arrowhead of Minnesota. According to NOAA's CPC, the 8 to 14 day temperature outlook suggests warmer than average temperatures continuing across much of the Upper Midwest from February 25th - March 1st. There may be a slight cool down late month, but the overall trend remains warmer than average. Here's the 8 to 14 day temperature outlook, which takes us into late February. Note that much warmer than average temperatures look to continue over the eastern two-thirds of the nation, while the Western U.S. looks to begin seeing cooler than average temps. Take a look at the temperature anomaly through Saturday, February 25th. Note that the despite a quick shot of cooler than average temps by the middle and end of this week, the eastern half of the country looks to stay warmer than average through much of that time period. Colder than average temps begin moving into the western part of the country next week and perhaps into the central part of the country by the last weekend of the month. 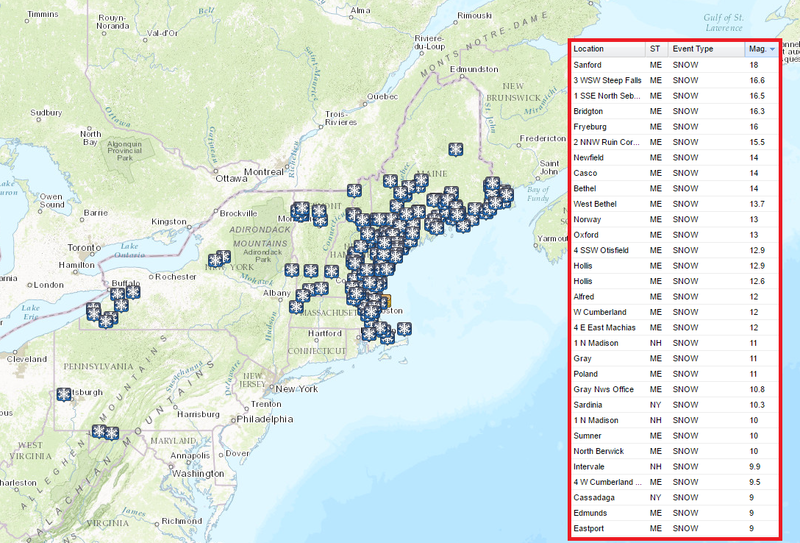 February has been a VERY snowy month for parts of the Northeast and the New England States. 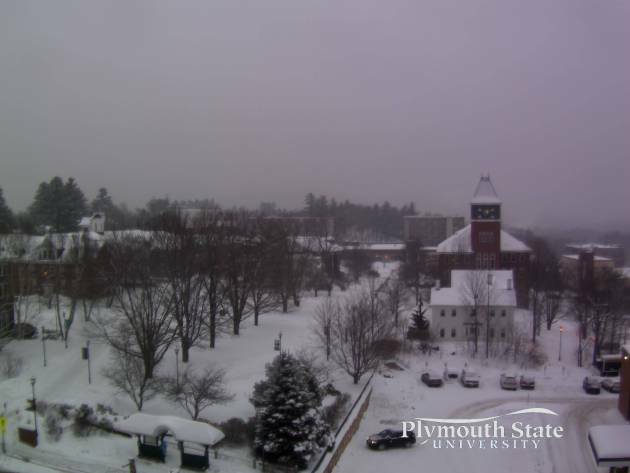 Here's the view from Plymouth State University located in Plymouth, NH, which showed snowy conditions once again on Wednesday. This storm may drop up to 12" in spots across the Northeast before wrapping up on Thursday. Here are some of the latest snowfall reports from the Northeast and note that several locations saw another 12"+! Note that this is the 3rd snow storm to impact parts of the Northeast in about a weeks time! 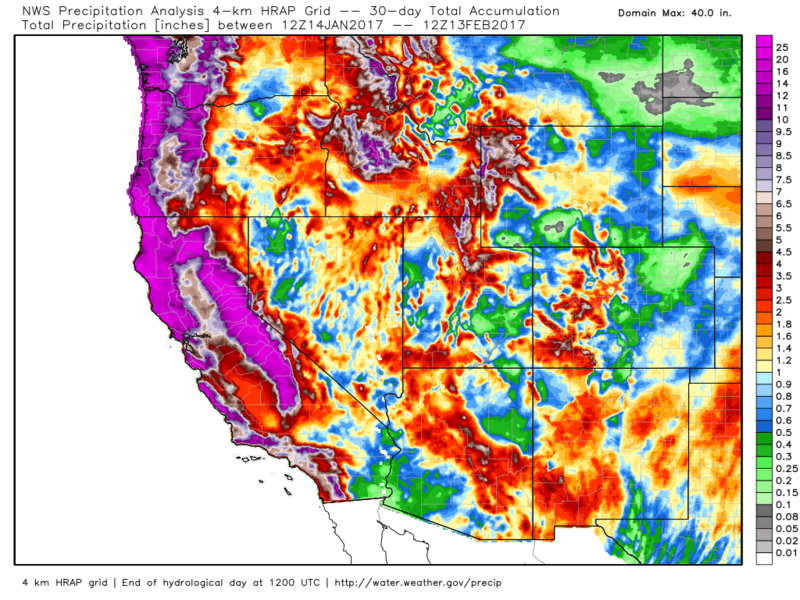 Take a look at how impressive the 30 day precipitation tallies are across the West Coast. Note the purple colors that indicate 12" of liquid! Some spots have quite a bit more than that and there's more precipitation on the way! 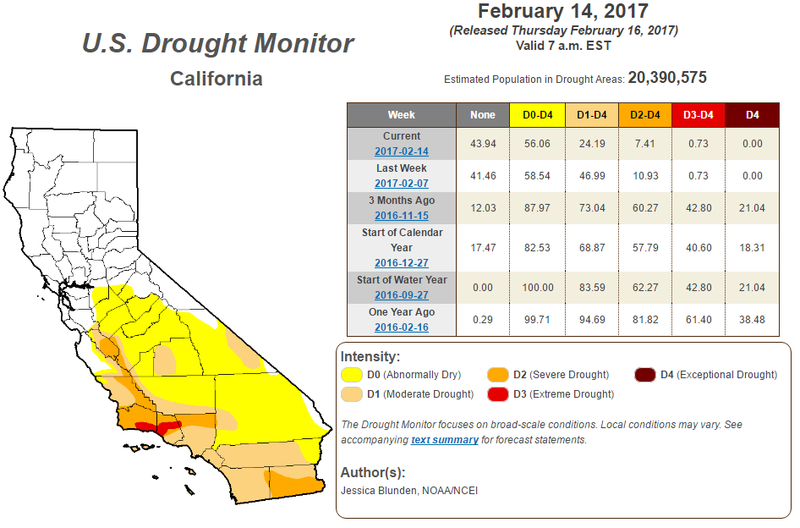 According to the U.S. Drought Monitor, the California drought continues to improve. Note that over the last 3 months, we have seen major improvement in the Exceptional, Extreme and Severe drought. With the additional moisture expected this week, we should continue to see even more improvement! Heavy precipitation has been falling across the Western U.S. due to rivers of Pacific moisture plowing into the region. Note the deep plumes of Pacific moisture that seems to be directed right toward the West Coast, these are the Atmospheric Rivers that are responsible for the extensive precipitation. Note the next big plume setting up just west of the region, this will be responsible for another heavy surge through the week ahead. Several rounds of heavy precipitation have blasted the West Coast and we're not quite done yet. Another surge of heavy precipitation will push through the region this week and weekend ahead with more possible into early next week with significant rainfall and flooding along with heavy mountain snow. According to NOAA's WPC, the 5 day precipitation forecast suggests widespread 6" to 9"+ precipitation amounts across the West Coast through the early weekend. This will likely help improve the drought even more as we head into the 3rd week of February. Here's a closer look at how much rain could fall around Los Angeles, CA and across parts of the Southwest through AM Sunday. Note that some spots near Los Angeles, CA could see nearly 6" or more, which could lead to flooding. 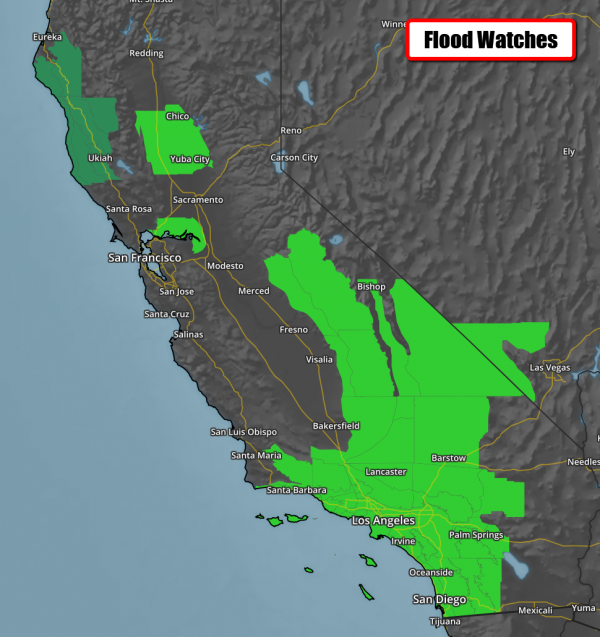 A number of flood watches have been posted across parts of California as the current storm system rolls through the region. Some of the Coastal and Valley areas could see 3" to 6" of rainfall, while the foothills and mountains could see 5" to 10" of rainfall. Here's the national weather outlook through the weekend, which shows another round of snow pushing through the Great Lakes and the Northeast, while strong to severe storms continue across the southeastern. Meanwhile, another surge of Pacific moisture looks to begin moving into the West Coast. This next surge of Pacific moisture will continue sliding down the coast and will likely bring parts of southern California heavy precipitation as well. Here's the snowfall potential into early next week, which shows heavy mountain snow developing once again across parts of the Western U.S.. Heavy looks to develop once again across the Cascades, Sierra Nevada Range in and across the Rockies. Also note the snow potential across the Midwest by the last weekend of February... while it is still WAY to early to tell what's happening with that particular snow chance, it's worth watching. Stay tuned! 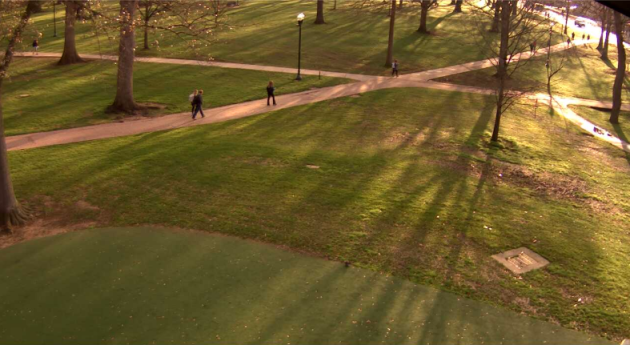 This was the view from the University of Mississippi in Oxford, MS early Wednesday. Note how green things are looking there! Spring seems to have already sprung! Temperatures will warm into the 60s and 70s here by the end of the week and weekend ahead. By the way, there are only 13 days left until the start of Meterological Spring (March 1st) and only 33 more days until the first official day of spring (vernal equinox on March 21st). According to USA National Phenology Network, areas in the green color below show where spring has already sprung across parts of the Southern U.S.. Their definition of spring is this: The appearance of the first tiny leaves on the trees, or the first crocus plants peeping through the snow? "The Spring Leaf Index is a synthetic measure of these early season events in plants, based on recent temperature conditions. 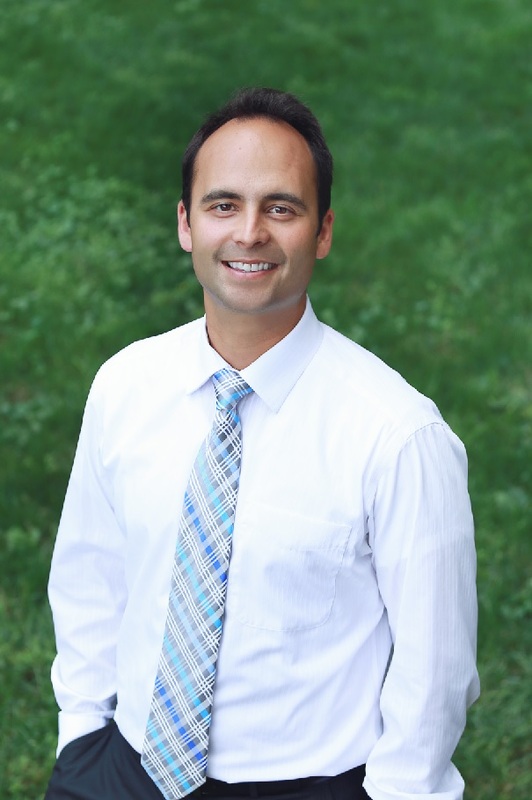 This model allows us to track the progression of spring onset across the country." "The map below shows locations that have reached the requirements for the Spring Leaf Index model (based on NOAA National Centers for Environmental Prediction Real-Time Mesoscale Analysis temperature products)." Interestingly, spring has sprung 20+ days ahead of normal in some locations across the Southern U.S..
"We can evaluate whether spring is arriving early, late, or right on time this year at a location by comparing the day of year the Spring Leaf Index requirements were reached in 2017 to the day of year the Index is typically reached. We determine what is typical for a location by averaging the day the Index was reached over the 1981-2010 period. The number of days a between when the Index was reached this year and when it is typically reached at a location is called the “anomaly.”"
While the Atlantic and Pacific Ocean basins remain quiet close to home, Cyclone Dineo is making headlines in Southwestern part of the Indian Ocean. This was the view of Dineo as it neared Inhambane, Mozambique in southeastern Africa AM Wednesday. "Firefall wows visitors at California’s Yosemite National Park"
"The "firefall" phenomenon at California’s Yosemite National Park is back. 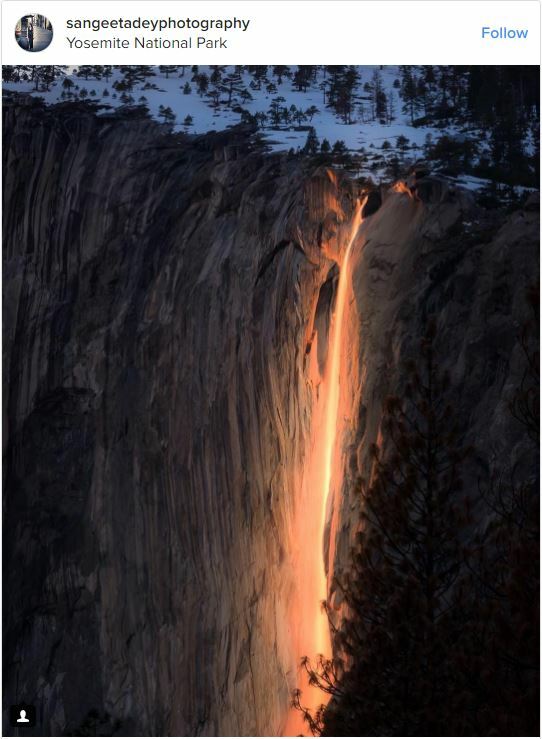 In mid-February each year, the sun hits the Horsetail Fall at just the right angle to create an illusion that looks like lava flowing off the side of the cliff instead of water. The firefall only lasts for a few minutes at sunset, and draws hundreds of visitors hoping to capture an out-of-this-world shot." Golf clubs this weekend, then shovels late week?